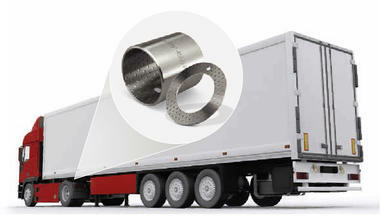 Close coupling systems are used between the trailer and towing vehicle on semitrailers. The distance between the trailer and towing vehicle is extremely small during forwards travel. The close coupling moves the trailer away from the towing vehicle by 500 mm in curves. The advantage over normal coupling systems is the longer loading area with the same total length. The bridge is twisted in relation to the trailer in curves. The twisting of the bridge is transferred to the ring gear. The ring gear engages in a ring gear ring on the crank disc. The connecting rod is fastened with bearings on the trailer and on the crank disc. This means that the crank mechanism is adjusted in every curve. The trailer is moved backwards on linear guides. In the speciied application, KS PERMAGLIDE® P20 plain bearing bushes are used for the linear guide. 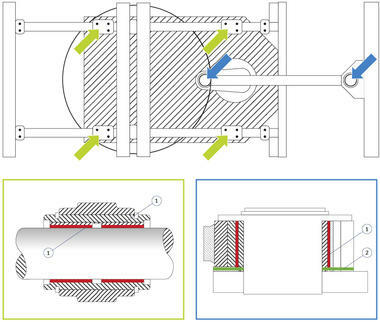 There are two rigid shafts running on the trailer in two KS PERMAGLIDE® P20 plain bearing units each. The plain bearing bushes are pressed into the connecting rod. KS PERMAGLIDE® P20 thrust washers are used for the axial bearing.